Online, interface designs fashion people's appearance, shape their communication and influence their behavior. Can we see another’s face or do we know each other only by name? Do our words disappear forever once they leave the screen or are they permanently archived, amassing a history of our views and reactions? Are we aware of how public or private our surroundings are? 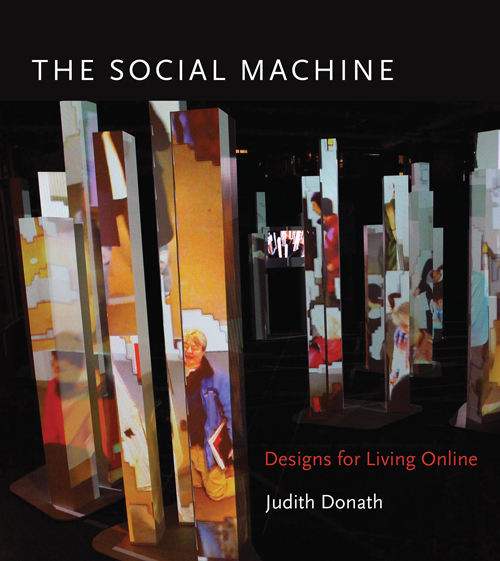 In “The Social Machine”, Judith Donath addresses topics such visualizing conversations and networks; portraying identity with data and history; delineating public and private space, and bringing the online world's open sociability into the face to face world. “The Social Machine” is a manifesto for balancing legibility, social responsibility and innovation -- and a manual for designing radically new environments for social interaction. Judith synthesizes knowledge from urban design, evolutionary biology and cognitive science to design innovative interfaces for on-line communities and virtual identities. A Harvard Berkman Faculty Fellow and formerly director of the MIT Media Lab's Sociable Media Group, she is known internationally for her writing on identity, interface design, and social communication. She is the creator of many pioneering online social applications; her work and that of the Sociable Media Group have been shown in museums and galleries worldwide. Her current research focuses on how we signal identity in both mediated and face-to-face interactions, and she is working on a book about how the economics of honesty shape our world.